Home / apacer / gaming / hard drive / ssd / Apacer brings AS681 Armored SSD. Apacer brings AS681 Armored SSD. Apacer released SSD AS681 ARMOR allowing your PC to operate with the fastest speed. Apacer views promoting the popularity of high-speed transmission as its own mission and rolls out the latest SSD, which adopts the next generation SATA III transmission interface. It provides excellent performance of read/write speed reaching 545/520 MB/s(960GB). ARMOR is perfect for gaming desktop, and laptop. Technologies progress with each passing day, and the capacity of files and applications in the computer rapidly increasing. Ideal user experience can be maintained only by updating hard drive read/write speed. The users are supposed to enjoy their experience of fast start-up and starting application in a second, and there’s no need to waste time in waiting for reading or writing. 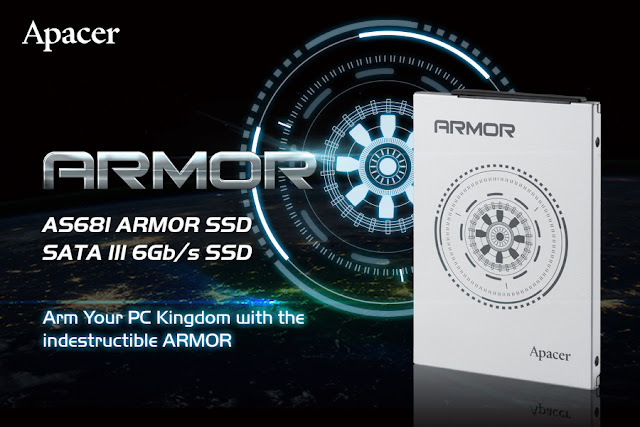 AS681 ARMOR is the latest SSD of Apacer, which represents the popularity of SSD. It adopts the next-generation SATAIII interface, provides ultra transmission speed of 6Gb, along with the most advanced 8-channel synchronous transmission design. Hence, read/write speed up to 545/520 MB/s can be achieved. In addition, ARMOR is the one and only for budding gamer's on a budget. Apacer suggests that desktop users use ARMOR as system drive, and the original hard drive can serve as data drive. Therefore, high transmission speed and massive storage can be achieved. ARMOR is thoughtfully available in 120GB/240GB/480GB/960GB capacities to meet the demand of different users. Upon upgrading their laptops with ARMOR, users can enjoy performance boost immediately. Boot time and speed of application start-up can be significantly improved. The Apacer AS681 ARMOR SSD has a 3-year global warranty. To know more about Apacer, visit apacer global.